Following yesterday’s mind-fest it’s time for some light entertainment. For today’s Psyche I present not one...not two... but three videos, all featuring American rock star Jonathan Siegrist climbing some of the hardest routes in the US. Le Reve - Jonathan Siegrist from MAXIM DYNAMIC ROPES on Vimeo. An interesting coincidence is that these climbing areas are all similar distances from my house in different directions and, oddly enough, I’ve not been to any of them (at one time I’d probably been to every published climbing area in the western US so this is saying something). And even though I’ll never do any of the routes in this post I absolutely need to experience the areas. It's a veritable ring of fire around my house, calling out my name. Fall is here, finally. Time to get some road trips on the agenda. ARC'TERYX Chasing JStar - Utah from ARC'TERYX on Vimeo. This is a great article for those who enjoy geeking out about fitness. For anyone interested in what I do for a living here’s a taste. I’m always evaluating the latest data and techniques looking for ideas we can incorporate into what we do. It’s from an elite climber and strength trainer Rob Miller and titled The Map of Athletic Performance. Articles like this are what opens the door for training advancements. I can’t say that I learned anything new, exactly, but certainly helped my thought process. I mean, we’re all working off of the same science so new aspects about training tend to come from experience and trying to think outside the box. This is why breakthroughs in training rarely come from scientists and usually from athletes and trainers (Rob is both) who experiment outside of known templates--why we call exercise physiology an “applied science”. This is similar to what Charlie Francis was doing with runners and Paul Rogers is doing with cyclists. Anyone interested in last week’s articles on customizing P90X should consider investing some time, so bookmark this article for reference. While techie, it summarized a lot junk you’re forced to learn in school and is much more fun to read than most text books. That’s because it stays focused on a subject, which is training for climbing, though its scope if far beyond that particular sport. The theories discussed here can be applied to any type of training. I’m going to try and break this down a step further for the layman by adding notes and perspective on various sections. Miller begins with the climbing aspect and goes into the general exercise phys stuff later, which I’m reversing for readability in my analysis. Getting “generally” strong is just smart. Whether it is to increase lean body mass for health reasons or to gain an edge at the sport you love. Full range of motion basic barbell movements performed well will have the farthest reaching impact in support of all athletic endeavors. Essentially, strength improves the body’s capacity to perform at a greater intensity. This is true for all developing athletes and remains true for even the most advanced. This is a great paragraph but it needs to be noted that Rob is a barbell trainer (how he makes his living). Of course that are others ways to accomplish this, but barbell training is his bread and butter. He knows it very well and can teach is safely, which everyone cannot do. He addresses that fact but he doesn’t explain that there are other ways to safely do compound lifts (he has no reason to) that are easier to learn. This is a challenge faced by any athlete who practices many different sports (hence most weekend warriors). He’s specifically addressing Crossfit and its misguided emphasis when it comes to sports (he has a long history with CF’s founder, discussed at length) but the challenge he’s addressing—-efficient sports specific training to leave time for sports specific work—-is the meat of what all athletes are after. The activities may be listed along the Map’s perimeter but the process of athletic development begins well within the Map’s interior. The activities being listed on the outside have to do with creating a trajectory for development. Reaching the outside limits of the Map means that you are up against your genetic potential in that sport. It is a rare individual that has exhausted all means to achieve greater abilities and capacities in his sport. But more importantly, an athlete on the outer reaches has developed other “supplemental” trajectories either by exploring other sports or deliberately pursuing physical qualities that his primary trajectory will directly benefit from. And this is one of the more significant implications of the Map. He’s just defined the concept behind “muscle confusion” from P90X, which we’ve taken to a much deeper level in X2. What’s so important in this paragraph is that you can’t change your genetic potential but within your genetic make-up you can improve your capacity for improvement and efficiency. That is what any trainer’s goal is with an athlete, to maximize their genetic capacity for performance. Prioritizing training time is weighed against the timeline of the upcoming season, event or competition in every stage of athletic development. Advanced training takes on a laser-like focus the further out on the Map one is, and it and becomes less tolerant of any superfluous training “noise.” Each training session has a clear purpose and all available resources go into achieving that purpose. The ratio of work to rest that productively drives adaptation no longer has a forgiving margin of error. The work is focused and deliberate, so that the body can be left alone to do its thing during recovery. The single biggest challenge most of us face, especially when life (job, families, etc) enter the equation. Efficiency is king but, let’s face it, most of us would rather do what we enjoy. Sometimes, especially if you want to maximize your potential, you need to put that aside and make decisions about what is best for you to reach your goals and not just what you like to do. 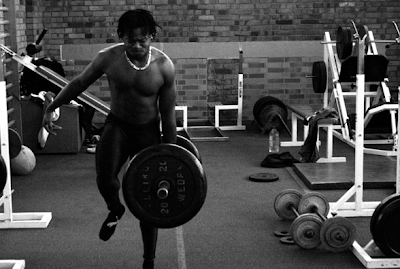 There is no parallel to the barbell in its ability to meet an athlete exactly where they are now in terms of neuromuscular efficiency and begin the process of progressively applying higher demands on the entire system. The neglect the barbell receives from both regular folks and athletes is something of a mystery, given its potential. Still, given that we live in a culture that sells products offering quick fixes or a “silver bullet” for most everything people are interested in, it is understandable that training with the barbell is undervalued or ignored. It takes time, like anything worth doing thoroughly. Because of the previous collective move away from barbell training in the fitness industry, few trainers have appropriate knowledge of its value or how to teach people to utilize it. The squat is the single most important exercise there is. Nothing else recruits more tissue doing more work than this one movement. The full range of motion squat done properly is the most potent tool in the gym. The other four add balance and support to this central movement. The time it takes you to learn something in the gym has a lot to do with how long it will remain interesting and effective, no matter what your goals are. Correctly performed squats take some time to learn. Even if your sport does not require squatting, and most do not, there is enormous benefit from becoming fluent in this basic human movement. ...this paragraph sounds exactly like one of my mentors, Fred (Dr. Squat) Hatfield. In an endurance setting, strength and power will always be expressed at a fraction of one’s overall potential due to the lower strength and power demands of endurance sports. Therefore, the increase in strength and power will directly benefit one’s endurance simply by increasing that overall potential, and thereby increasing the reservoir from which to pull that fraction. This is very important. My biased definition as to why P90X2 is so important for all athletes, even endurance athletes. Perhaps the misguided emphasis on cardio-respiratory endurance will shift when more people try alternatives to mainstream ‘trendy’ workouts. Maybe the idea that “more” is not better will begin to sink in. Very true but he’s talking about elite athletes. The emphasis in their training has been moving this direction now for more than a decade. The exact point is discussed in the X2 guide when addressing why there is no “cardio” in that program. This is a quick synopsis of a broad topic. In the article he provides a nice discussion of energy systems and how training them applies to everyone. It’s very important to understand that no matter what kind of sport you want to train for. I’m saying that if you’re training, then it’s time organize your climbing into a weekly period of work-to-rest for the best results. To get the most out of the climbing you are already doing, we’re going to organize your week around a primary session called the Heavy Day. This is the day, or a combination of days if you go climbing for the weekend, that will be driving your intermediate rate of adaptation. This is the stressor that your body will need a full week to recover from. It doesn’t mean the intermediate climber takes a week off. He needs to engage those skills during the week of active rest. This way, skills stay sharp and are ready to ‘neurologically fire’ when fully recovered. To accomplish a full intermediate recovery, you’re going to follow the Heavy Day with one Medium Day and one Light Day during the remainder of the week. The A,B,Cs of training. I’ve written on this a lot and it’s the focal point of my latest training article for DPM Climbing. 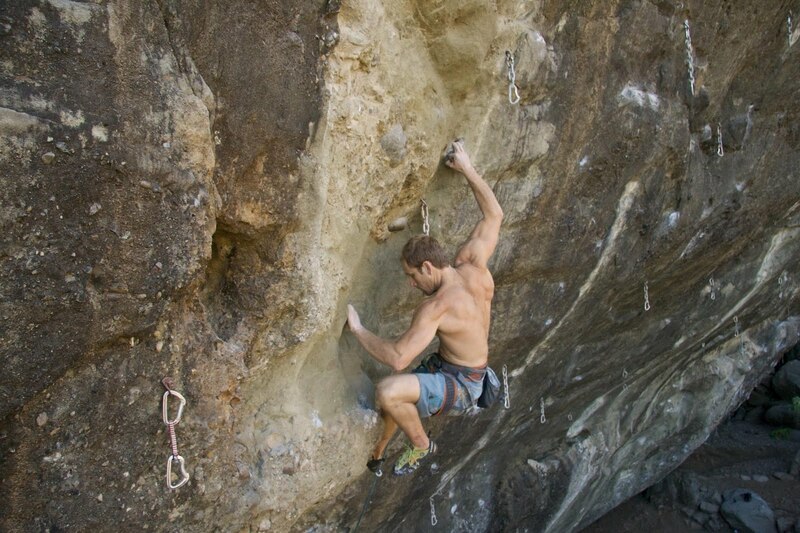 Your body is conditioned to climbing. 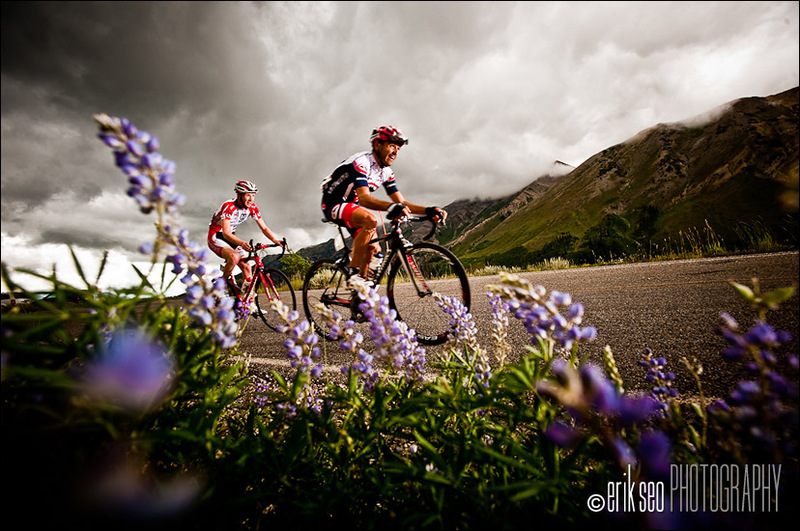 So some climbing, even at your limit, won’t inhibit your recovery. It’s when you don’t understand how to actively recover, or that it’s necessary, that so many climbers eddy in a performance slump way longer than necessary. Interesting in that this is what the Spanish do, and they have the most strong climbers in the world, by far. They call it tranquillo y a muerte (you mostly relax but when you do climb it’s “to the death”) and, I think, many traveling Americans have trouble with such a small volume of climbing—-myself included (we’re on limited holiday time fer crissakes)—-but those who do embrace it generally improve. 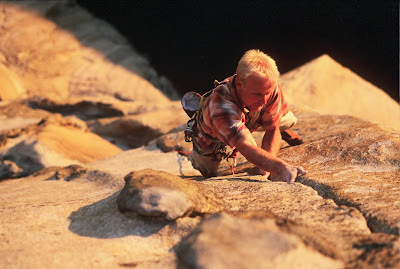 So why do climbers do the same thing as the example tennis player, and climb routes that don’t really challenge their abilities – a bunch of sub-maximal work that doesn’t challenge the skill set? 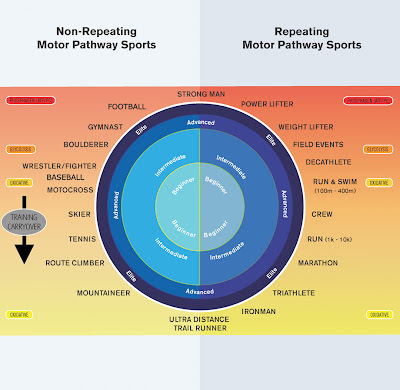 Since there is no specific motor pathway being practiced – because the sport consists of myriad ways to climb any route – there is no point in the sub-maximal repetition. The worse case scenario is that the sub-maximal work at higher volume sets them up for injury when they do ramp up the intensity, like ‘junk’ miles on a bike for a cyclist. This is key. Most of us waste a lot of time like this. It’s why you see people climbing for years and years and never really improving. Maybe they get slightly better when, say, they lose a few pounds for a redpoint but never by much. Focused systematic training out of your comfort zone is the only way to reach your body’s capacity for strength. What he leaves out, which is important to less serious athletes (most of us) is that “junk miles” (or its sports equivalent) is important for season athletes as a way to condition the body when you haven’t practiced a sport in a while. Skin conditioning of the hands for climbers, feet for runners, and saddle area for cyclists are simple examples. 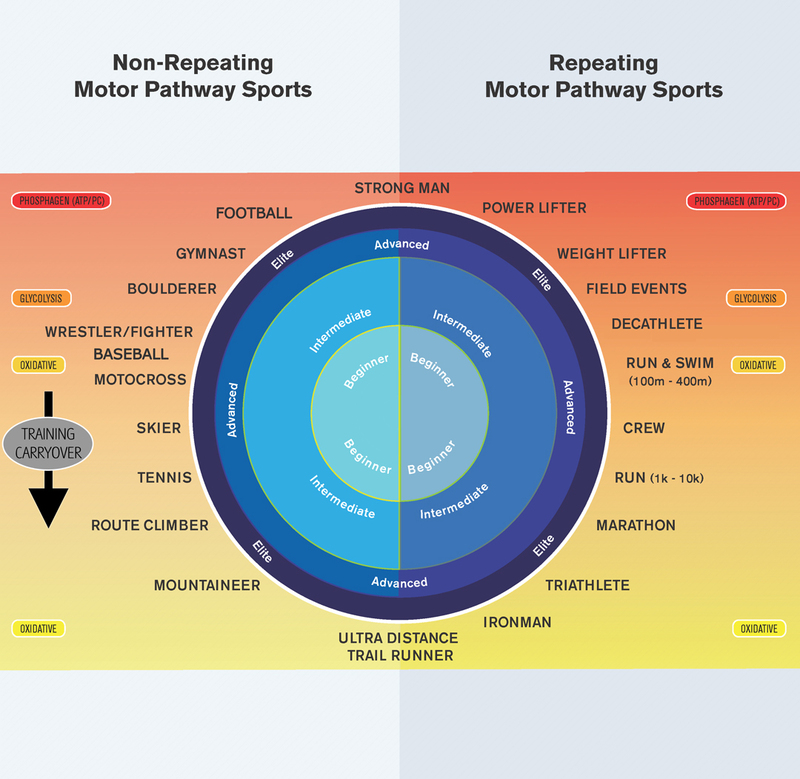 Re-engaging neuromuscular patterns is another. This should not detract us from his main point, which is that creating a strong foundation of fitness minimizes our need for “junk” volume. The difference at the advanced stages is that the athlete is so developed in his specific sport that it’s really difficult to apply enough of a stress that the body will have a hormonal response. That stressor doesn’t have to come from the sport you’re training for. That’s what happened to me when I got into CrossFit. Not identifying the unfamiliar stimulus was unfortunate. I could have saved a lot of valuable training time. Strength takes the longest to develop but it also sticks around the longest. Endurance comes and goes almost by the week. 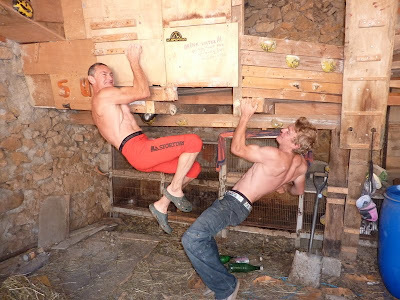 Strength is persistent and has the greatest training carryover, like in our bouldering example. I think he’s underselling endurance. As any cyclist/triathlete knows it does take a while to bring all of your various “endurance” parameters up to speed. You improve by the week but it takes many weeks to have everything humming along perfectly. However, his main point, that strength takes the longest to train (he means power or “absolutely strength” or muscular efficiency) is not only valid it’s the one essential key to improving performance even as an endurance athlete. 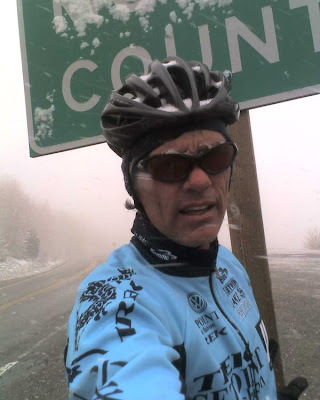 It’s harder to train, takes both focus and specificity, and, mainly, to truly address it you must curtail your endurance training, which is a hard sell for most of us who are addicts, especially true of runners, cyclists, surfers, and climbers. It’s really the key to the entire article: that we neglect full body strength training in favor of random volume. It’s not a coincidence that Francis and Rogers, who coached a stack of Olympic champions, were thinking along the same lines. above: note no cyclists on the map. This is because those sports are hard to define this way. A road racer, for example, is an endurance athlete whose entire success is dependent on the anaerobic pathways, or the ability sprint or climb a hill at key points in an otherwise aerobic race. this means both areas must be trained with specific focus on the individual depending on the type of races they want to do well at. 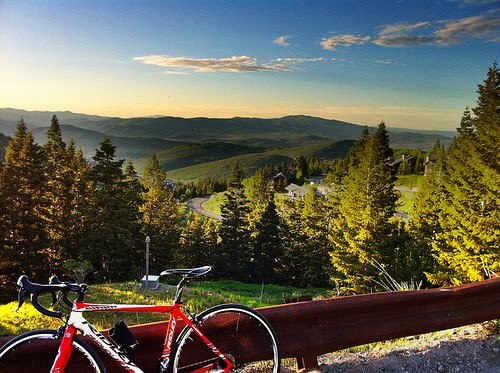 80 miles, 3 iconic climbs, epic scenery, and not a single stop light; it just can’t get much better. I’ve ridden my bike all over the world and this is one of the better rides I've done. If you have a free day in SLC, some fitness (8’000-ish feet of climbing), and prefer roads over trails, this is the one. The only caveat is that you have to be willing to get your precious road bike dirty a couple of times. Otherwise, it’s pure Nirvana. 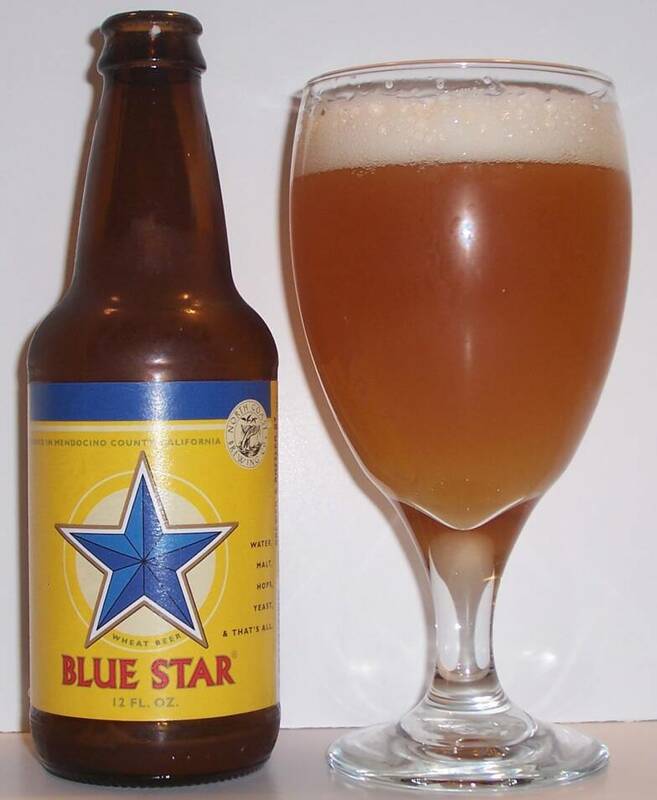 The ride begins at Blue Star Coffee in Canyon Rim (in SLC at 23rd and the 80). They have fresh juice, roast their own beans, and make fantastic bagel sandwiches. It’s also the home of Wasatch Bike Support so not only can you fuel up you can pick up supplies and maybe squeeze in a last-minute tune (don't tell Tyson or Chris I said they'd have time to tune you bike on the spot but they probably will if it's nothing major). They carry Hammer, Honey Stinger, and assorted other foods for your ride. Begin heading east on the frontage road. Turn left on a small path by the baseball field to access the bike path through Parley’s Historic Nature Park. Ride through the park, over the 215, and turn left (north) on the bike path junction. The bike path delivers you onto Foothill Blvd for your only foray into traffic, which lasts less than a minute. At the light (you see a few lights but always have a right turn), turn right and immediately left, following bike path signs. Ride north through a neighborhood, then climb up through a golf course. Make a left at the top of the hill and descend to Sunnyside Dr (Emigration Canyon Rd). Climb Emigration Canyon. It’s a fairly easy 7-mile (approx. 1,500’) climb leading to a nice summit, aka Little Mountain. Emigration usually has some traffic but it has a great bike lane, is usually busy with cyclists, and almost always very pleasant. Descend off the back to East Canyon. Turn left. Climb Big Mountain. This one’s a bit stiffer, feels more isolated, and offers an outstanding summit. Drop off the back of Big. Now the ride feels remote as you’re looking at open space as far as you can see. 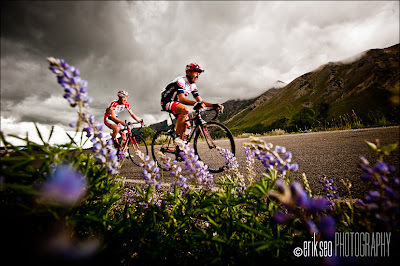 If it all looks familiar, it's because the Tour of Utah rides it (in reverse) most years. at the summit of big. weather can be a little spotty at times. Near the bottom of the descent look for a right turn (might be a sign to Jeremy Ranch, which comes and goes) on a dirt road and get ready to Paris-Roubaix out for a few miles. Training tires/wheels (with plenty of air to avoid pinch flats) recommended. When the road becomes tarmac again you’re in Jeremy Ranch. At the gas station, turn left on the frontage road (more scenic than it sounds). Take this past the next junction (hwy 224 and I-80) for another half a mile and turn right, go under the 80, and immediately left onto Highland Dr. Hop onto the bike path and follow it along Highland to Silver Creek Rd. Turn left and cross the 40, then right onto the frontage road (again, much nicer than it sounds). If you need fuel there’s a gas station here with a pretty decent restaurant inside. Take the frontage road to the next junction. Turn left (away from Park City) and in about a quarter mile turn right onto the bike path. 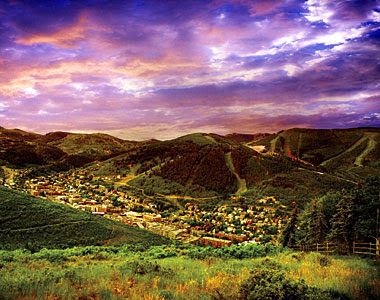 Follow this into Park City. When you hit White Pine Touring (bike shop if you need anything) you have a choice to make. It’s faster to jump on the road here but I prefer to stay on the bike path and cruise up through Old Town. Stay alert for a small sign saying “Deer Valley” which takes you through a tunnel and off of the bike path at the round-a-bout (there's only one), where you take Deer Valley Dr (not Marcac) uphill. On the streets you'd go left at White Pine. Left at the light (ugh, a light you might have to wait for! ), and left at the roundabout. Just before the ski area turn right onto Royal Street. 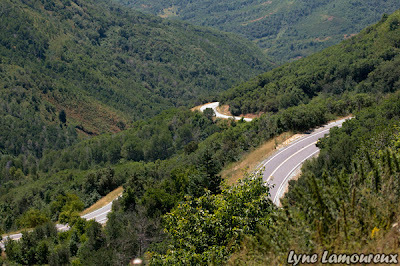 Take this iconic climb (for locals anyway--it's a perfect climb: winding, scenic, great tarmac, not too steep) to just before its end (at Silver Lake) and take the short descent down Guardsman Connector to Marsac and keep climbing. Your first really steep pitch just before Empire Lodge, a taste of things to come. If you need water, supplies, or a bathroom you’ll want to stop here. Empire Lodge is very bike friendly all summer but closes in Sept. Fuel up as, even though you’ve only got a few hard miles left, you’re about to earn your ride. 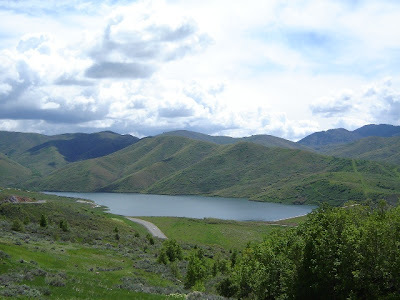 You can bail from here, ride down the main route through Park City, Jeremy Ranch, Summit Park (a short climb), descend Parley’s Canyon (on I-80), and get back to SLC with hardly any energy expenditure. But if you’ve come this far you might as well dig a little and earn your beer. Leaving Empire the ride is different. So far, even though there's been a lot of climbing (probably 50 miles and 6,000'), it's been pretty civil. The road now, for the first time all day, is seriously steep. At the top of Deer Valley (only a mile or so), you have a brief descent, and then start heading up Guardsman’s Pass road. Get ready to rumble. NOTE: the next paragraph is now in the name of lore, this section has been paved. It's not nice pavement, and it's still steep, but much easier to ride than it once was. Some might even say it improves things. Not me. The road quickly turns to dirt. Steep dirt. Steep, slightly gravelly dirt. And not all that compact (varies with the season). Some sections are smooth. Others not. It will force you to pick lines and, for some reason, there always seems to be more traffic than you want, which is none, because it both kicks up dust and reduces your ability to choose the best line. It's only a couple of miles but it takes fitness, technique, and mainly the desire to do it. But hang in there because you’re about to be rewarded with a 20-mile, 5,000' descent--well worth a bit o’ toiling about. 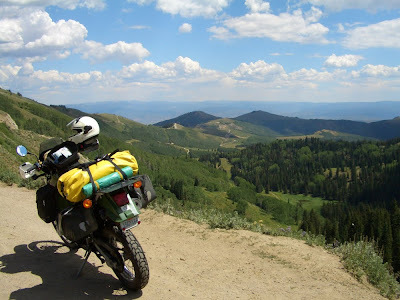 Enjoy the descent of Big Cottonwood canyon. Yee-haw. If you're parched, cold, or hungry you pass Silver Fork Lodge a few miles off the top. 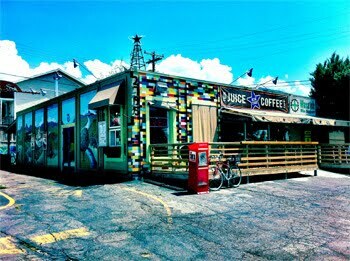 They have both local coffee and beer, a lots of assorted diner-style food. Climb Fortuna (steep for half a mile) and then descend it to Jupiter. Go left and take the first right and then the first left (both come quickly). You should be on Hale St that will hit Parkview shortly. Go left and down to the Mill Creek junction (4 way stop). Go straight through the stop and turn right on Wasatch. Turn right at the light, which winds around left. At the end of Wasatch Blvd is the bike path you started on. Take this down to the right fork, go back across the freeway (215) and through Parley’s to finish at Blue Star. Then hope George has got his beer license sorted out. Today’s Psyche is friggin’ awesome. Killian Jornet going nuts in the mountains and, basically, changing the game of mountaineering. But most it’s just mountains. I love them and have hardly spent any time up there in the last few years. It simply has to change. ...one of the world's great endurance runners, has speed soloed the long, technical and exposed Innominata on the Italian side of Mont Blanc in a scant 6:17. The time is amazing on many levels. While technically the climb is easier than the north faces of the Eiger or the Matterhorn, the scale is much greater and the objective dangers are higher. Jornet, who is not even known as a climber, started from the church in Courmayeur at roughly 3,300 feet and ran the 12,000 feet to the summit of Mont Blanc, then ran over 12,000 feet down the French side arriving at the church in Chamonix in a total time of 8:43. He covered over 24,000 vertical feet, climbing and running roughly 20 miles over glaciers, loose rock faces and miles of snow and ice slopes, all solo. This is another great video of Killian and Anton Krupicka running a super fast time on the Grand Teton. I used to spend a huge portion of my life doing stuff like this. Slower (who isn't?) but it was the same deal. Running up mountains with no gear, no water, passing people all day who acted like you were crazy. Ticking off "week long" hikes and climbs according to the guidebooks in a single push. So psyched. So. Psyched. I’ve got to get out more! This is a reference post for those looking to use P90X for specific purposes like sports, weight loss, or muscle gain. I also explain how to mix it with other workout programs, like Insanity. There’s a fair bit of reading here but it’s pretty straightforward and very condensed—essentially just the basics of periodizational sports specific training—and well worth your time if you want to tailor P90X to suit individual goals beyond just getting in shape. The principles here are valid for P90X2 as well. Of course the schedules would change but all the other info is vital for understanding specific uses of these programs. These are posted in order. If you’re confused skipping ahead, chances are your questions were answered earlier. If not, post a question on the Team Beachbody Message Boards and it will get to me. We love to make dieting complicated but the reality is the 95% of the obesity epidemic can be blamed on one thing: we eat a lot of junk. You’d never figure this out looking at the diet section of your local bookstore, though, where it seems like everyone on the planet has a different opinion on why we’re fat and thinks you need to read 300 pages and redesign your beliefs and lifestyle in order to eat healthy. Truth is, eating ain’t that complicated. So today I present three steps that will lead to weight loss if you follow them with common sense. First a little background. The three steps are presented in my latest article, Fit For Fall in 4 Weeks over at DPM Climbing, along with some training for climbing. 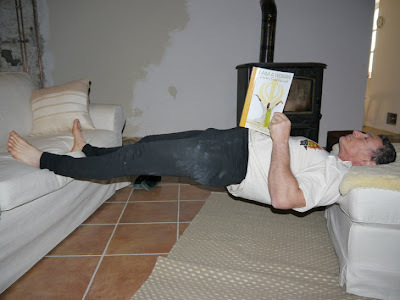 The plan is a simplification to one of my early articles for Beachbody in 2001 that has been revamped many times and was also the basis for the nutrition plan for Yoga Booty Ballet. It’s essentially a less OCD version of all of Beachbody’s diet plans that leads you to the same outcome, eating natural foods and minimal junk. This isn’t a knock on all those books or other nutrition plans. Most can be helpful. One might be exactly what you’re looking for, since there are as many ways to eat healthy as there are personalities. I’m all for reading about nutrition, especially since I write about it for a living. I’ve written thousands of pages about it. Reading them all will certainly help you learn (in the mood, start here). But since many of you have other interests in life my goal is always to keep things as simple. For those of you disinterred in become nutrition experts here are three simple steps to weight loss. Drink a gallon of water a day for a week. Plain water only. We spend most of our lives chronically dehydrated, which does two big things leading to us getting fat. First, it makes you hungry when you’re actually thirsty. Second, it causes your body to retain water, making you heavier. There are a lot of other unhealthy things associated with this condition but today we’re sticking to the basics so this is all you need to know. The best way to stop retaining water is to drink water. Lots of it. The obesity trend began with the rise of soda as our de facto beverage. Soda is the worst food in the world. Drink water, not soda, and you will be smaller. Cut out junk for a week. Okay, here’s the rub. We eat junk—a lot of junk. Most restaurants are junk. Fast food is junk. Most of the aisles at your supermarket are filled with junk. “How do I even know what junk is?” is a common excuse. But you do know, don’t you? When you chose fries over a salad you chose junk. The cookies your friend brought to the office, junk. KFC on the way home because you were in a hurry, junk. Big Gulp to take the edge of the heat, et al. You know. I wrote this dismissal of the USDA’s food pyramid because the pyramid-now-plate ignores what’s wrong with how we eat. We don’t really need to nitpick carbs and fats and proteins. We certainly don’t need to bicker over what kinds of fruits are healthy. We’re fat because the stuff we live on isn’t on the USDA’s pyramid, or plate, at all. Eat meat from animals and plants from the ground. Avoid foods with words you can’t pronounce, drive through restaurants, and shopping at the gas station. Overeating real food is actually pretty hard because you’re getting fiber and nutrients and your body sends signals to your brain that it’s full. Junk, devoid of nutrients and stuffed with calories, does the opposite. You’re always hungry because you’re lacking nutrients even though you’re eating way more calories than your body can burn. Simply cutting out junk will fix your issues most of the time. Finally we address habits. Not only do we eat junk but we eat too much. In the land of “all-you-can-eat” we’ve lost touch with reality. For one week have a juice or smoothie for breakfast and lunch and then eat a normal dinner. 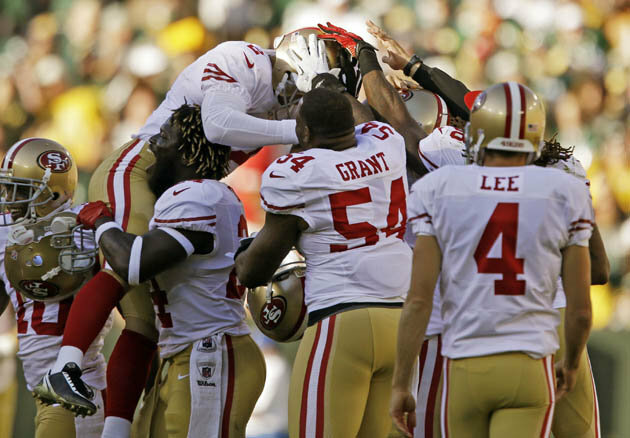 The catch is that the above rules are still in play. You’re drinking loads of water and you can’t have junk. This is a version of something we do at Beachbody called the Shakeology Cleanse, though I’m making it less strict. You can put anything you want into your smoothies (or juices if you have a juicer) as long as it isn’t junk. This means that you’ll likely start with a protein or meal replacement base and then add fruits, veggies, and maybe seeds. You can’t add sugar, or ice cream, or Skippy (read labels). Dinner isn’t regulated, so you can fill yourself up, but with the no junk rule in effect you’ll likely stop eating when you’re no longer hungry. The trick in all of this-—if you want to call it that—-is to learn a lesson about your body’s relationship with food. Food is fuel. It’s there to help our bodies work better. Eating well improves your performance, which is something society has forgotten. Instead, we tend to eat because we’re bored, or depressed, or happy. We’ve turned it into a crutch instead of a tool. Yes, eating is fun. It can, and should be, rewarding. But the reward should be for a life well lived. And we live a lot better when our bodies function like they’re supposed to. Last weekend I humped a load of bolting and climbing gear up to one of the cliffs I’m prepping for my birthday challenge. It was hell, reminding me of how soft I’ve become as a working stiff. I need to get my toughness back and, since it’s mainly mental, I’m searching for Pscyhe. Mind you, I’m reasonably fit. I just managed to finish “the hardest” 100-mile mountain biking races (2nd in class, apparently--shocked by a medal that showed up this week) and am less than a year out from competing at a world championships. But fit and tough aren’t the same thing and climbing, particularly first ascenting, requires a lot of toughness. Traipsing around in the mountains with a massive pack and spending hours mimicking a construction worker hanging upside down was once a daily activity for me. I’d taken for it granted because I was used to it. But it is hard; both physically and mentally. You’ve got to want to do it. Otherwise it’s too easy to leave it to others. And nothing—nothing!—I’ve ever done encapsulates the last two lines like offwidth climbing. It’s such an amazingly-miserable endeavor that one pitch of it on a 3,000’ wall will often have climbers searching for a different line. The number of climbers who seek out offwidths is so small that they’re pretty much all close-knit friends. It defines the word tough. For this week’s Psyche I present offwidth climber Pamela Shanti Pack. You’re about to see what I mean. Get inspired. 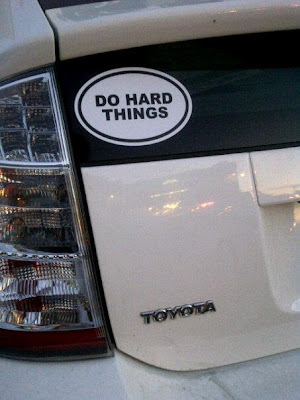 You too can do hard things. My latest training article for DPM hit the shelves this week. It can also be found on their web site by clicking here. This is a follow-up post, to add both some detail and personal perspective on why this protocol was chosen and how you might alter it. I am this article’s target audience as it’s almost identical to what I’ll be doing for training this month. It wasn’t my plan when I wrote it but life got busy and I now find myself lacking climbing fitness as summer wanes. Sending temps are coming and, when pressed for time, hangboarding is by far the best bang for your buck to improve quickly. In 1990 I had a fledging business that didn’t allow me to go climbing at all, forcing all of my training around a board in my shop. A serendipitous meeting with a Swiss exchange student, who showed me techniques far in advance of what came with the Metolius Simulator (the only board on the market back then), led to a two month training cycle that transformed me from a 5.10 to 5.12 climber. In the md-90s one of our friends followed his girlfriend to grad school. A shy lad, he didn’t bother trying to meet climbing partners. Instead he hung Yaniro Board in their apartment and started entering all the national competitions. Out of nowhere, he always finished near the top. 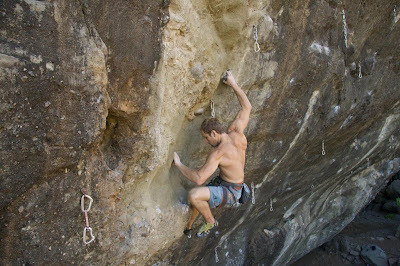 This is a guy who’d only redpointed a few 5.12s, did very little actual climbing, and was suddenly beating guys you’d read about in every issue of Climbing. He simply became so strong that he could hang onto basically anything. Last year, what’s left of the old Santa Barbara crew, Phil and Elijah, lost their climbing gym, The Shed, a state-of-the art training facility. They bought a Beastmaker, a Moon Board, and hung them in a garage. Turns out a gym full of equipment was mainly keeping their focus from where it should have been all along. Both had the best climbing season of their lives. Another of our crew, Micah, used a hangboard because he had ankle reconstruction and couldn’t walk. Before he could even go on a proper hike he ended up redpointing the hardest route of his life. 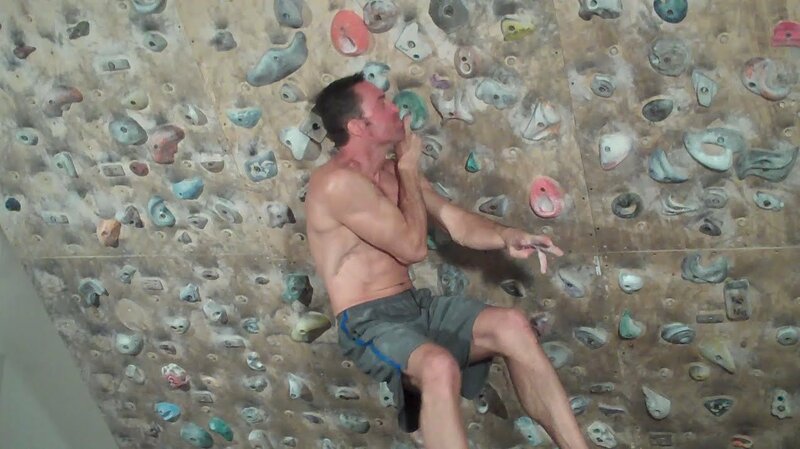 There are many ways to train effectively for climbing. Almost all of them have some amount of merit that vary in effectiveness due to the individual. Like I state in the article, if you don’t know how to climb there are better ways to spend your time. But when all is said and done, the ability to hang onto holds and not let go is always going to be the single most effective way to raise your level. The routine I wrote for DPM is just one option that has worked very well for me. As a multi-sport athlete I’m always in and out of climbing shape. This is the best plan I’ve found for getting back into shape quick, without spending much time (I work a lot). Following the links in this post will give you other ideas. All of them are good. Training should always have an individual element to it. Find what works for you. The lock-off hangs are very stressful. Proceed carefully. They are a suggested protocol. If you aren’t strong enough and need to alter them your training will not suffer. Do them when you’re ready. Training is only as effective as your ability to recover. The article's schedule is a suggestion. 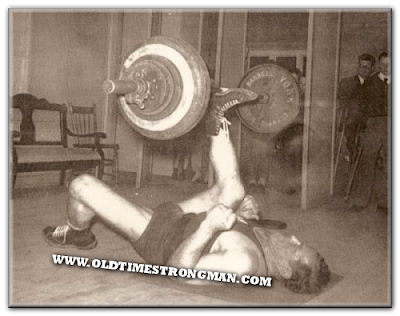 Tony Yaniro once wrote an article stating that he never decided if he was going to train until he warmed up. If he felt strong he trained. If he didn’t he rested. 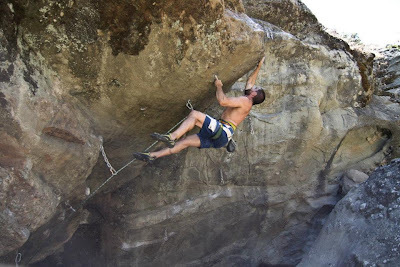 This can be tricky to gauge but climbing is a tricky, subtle, sport where you put an excessive amount of stress on very small muscles and connective tissues. Listen, astutely, to your body. Hangboard training is generally safer than most forms of training because movement is controlled. Still, it’s easy to get hurt training for climbing no matter what you do. Remember Stevie Haston’s first three rules and live by them. The article presents a few tricks I use to lose weight. I dig a little more into the thought and history behind them next week. For now, drink water. A lot of water. It both keeps your connective tissues strong and helps you lose weight (note the scribbling on stevie's board). And nothing, not even a hangboard, can improve your strength to weight ratio as much as shedding some pounds. pic at top, tommy caldwell. want to climb massive virtually holdless granite slabs thought to be impossible? hangboard train.